How can you shake off those niggling everyday worries? If you would like to re-focus and re-charge your batteries, try losing yourself in colouring in. 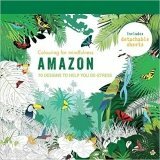 Choose at random from the illustrations in this book, which are all inspired by the Amazon rainforest. There are absolutely no rules - use felt-tips, pencils, gouaches or pastels. Just choose any colours you like and get going. Gradually, as the images come to life, you'll find calm returning. The sheets in this pad are all detachable, so you can display your favourite creations. Just 5-10 minutes a day of colouring in is enough to encourage mindfulness.